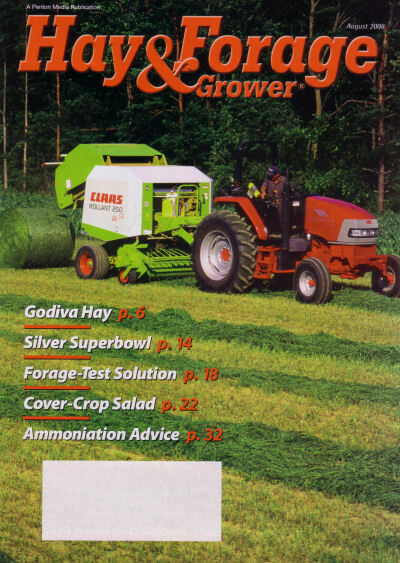 This article was in the August 2008 issue of Hay and Forage Grower and is reprinted with permission. It is copyrighted by Penton Media with all rights being reserved. Don Myers raises alfalfa, corn and soybeans on a picturesque parcel in Pennsylvania. The 80 acres of tillable land on the small farm he and his brother, Joel, own is largely surrounded by woods. Yet the majority of it produces high-quality bale silage. 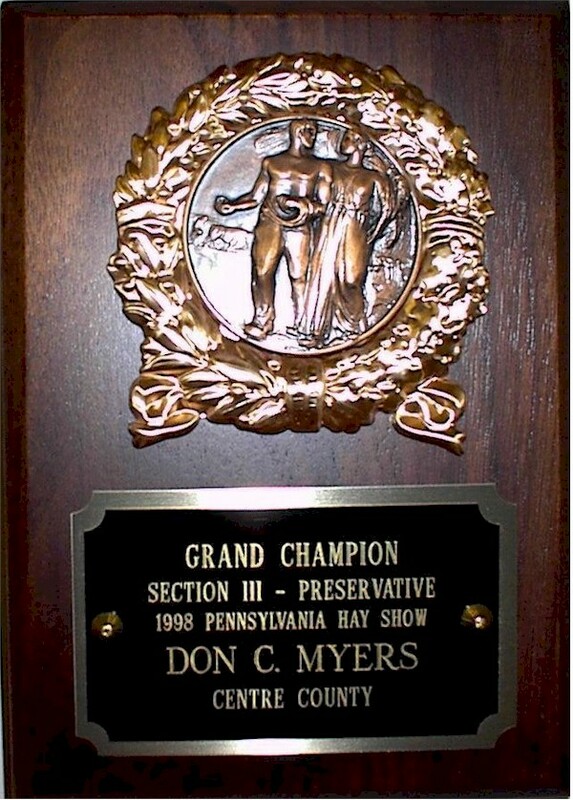 A part-time hay grower, Myers nevertheless exhibits a full-time fascination with baleage, haymaking, machinery and agriculture in general. Even his bread-and-butter career is ag-related; he sells real estate, specializing in farms and farmettes. "I can spend hours talking about baleage and hay production. I find it fascinating to look at what other people are doing," he says. Raised on the 180-acre farm he and Joel operate outside of Spring Mills, Myers can reel off the haymaking equipment his family has owned since the mid-1950s. Talk mower-conditioners and balers with him and you're likely to learn a machine's history, which manufacturers produce the best models today, and why. His daughter, Amy, a music teacher who rakes hay and helps haul and wrap bales for her dad in summer, talks about the operation and Myers with equivalent enthusiasm. Asked how she'd describe her father, she doesn't hesitate: He's particular and detailed, she laughs, but in a good way. I am particular in how I farm, admits Myers, current president of the Pennsylvania Forage and Grassland Council. It's in my nature. He researches, studies and experiments to optimize his crop management, quality and harvesting efficiency, with a goal to improve some part of the operation each year. Most years, he says, he achieves that goal. One year, for example, he bought a wheel rake to more than cut his raking time in half. A few years ago, he no-tilled alfalfa into frozen ground. We had the best stands we ever had, he says. Nearly 10 years ago, he moved away from producing dry hay, retiring his small square baler in favor of a round baler, a bale wrapper and a tractor with a bale fork. “It's a tradeoff because it costs me more to produce baleage.” He and two others can easily mow, rake and bale 25-30 acres of bale silage in two days where it took three days to harvest 10 acres of dry hay, he says. He needs one less laborer and increases quality by being able to get the hay off the field faster. As a self-employed realtor, Myers has the flexibility to be in the field when he needs to. At the same time, he brings his ag background to work when potential buyers want to talk soil type and crop production. 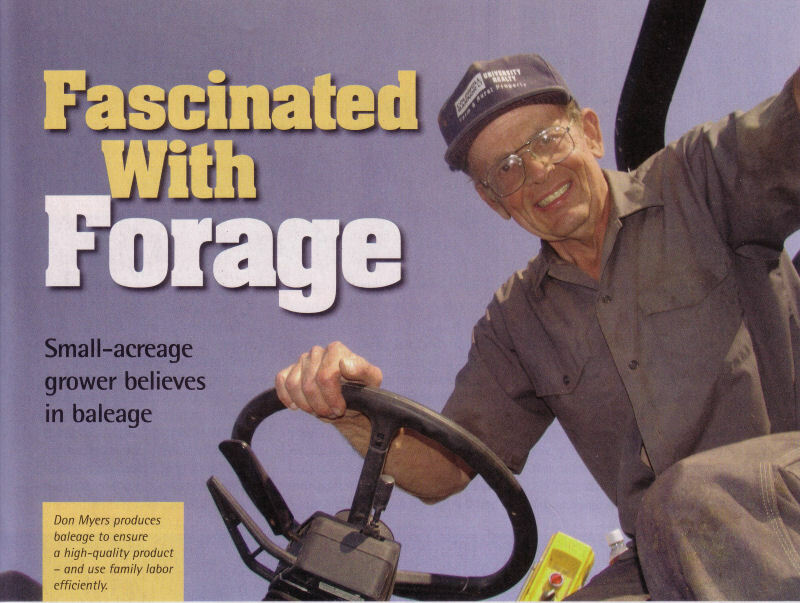 He markets the baleage by advertising in the local paper when needed and also refers customers to a Web site that he built, offering a posted newsletter and alfalfa and baleage production tips. A Myers-produced DVD called “Profiting From Alfalfa” is available for sale on his Web site, www.myersfarm.com. It expands on the tips mentioned above, quotes university research and gives viewers a taste of Myers' enthusiasm. “I won't skip church or Sunday school to make hay, but if the hay's fit after that, I'm not going to leave it sit in the field. To me, farming isn't work. I would far rather be in the field running a mower-conditioner or baler than sitting on a beach watching the ocean,” he says.